The Bridge of the Gods is a toll bridge spanning the Columbia River to connect SR-14 in Washington to I-84 in Oregon. The bridge is owned and operated by the Port of Cascade Locks in the city of Cascade Locks, Oregon. It is open 24 hours per day, 365 days per year, unless otherwise noted for maintenance, construction, or temporary event closures. Bridge tolls and limits are listed below. 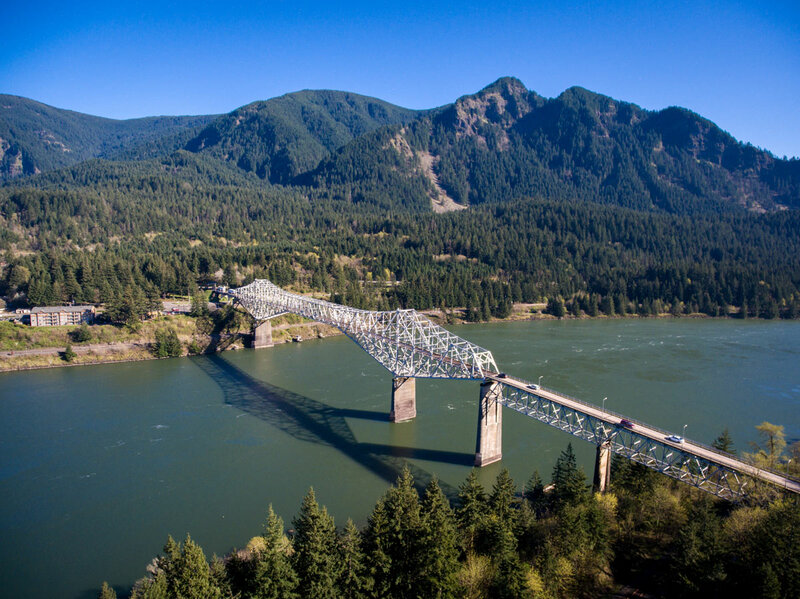 Toll coupon books may be purchased at the Bridge of the Gods or Port of Cascade Locks Main Office located in Marine Park (427 Portage Road Cascade Locks, OR 97014). Please note that the bridge does accept most major credit cards, though additional fees do apply. The bridge is open to pedestrian and bicycle traffic as well, therefore vehicles should be alert and yield to non-motorized traffic. Revenue from the bridge pays for maintenance, painting, inspections, and Port operations. Annual traffic crossings average about 1.6 million vehicles. The annual value of goods that cross the Bridge is approximately $35 million per year. The bridge plays an important role in the regional economy on both sides of the Columbia River. Additional bridge information is available below. Photos/videos of the bridge? Please note that film permits are required for all commercial photography and videography on and around the Bridge of the Gods. For more information, please contact: jmccartan@portofcascadelocks.org or 541-374-2405. **Over Dimension Vehicles require approved Over Dimension Permit issued by Port of Cascade Locks. Please fill out the form and return to the contact information located on the permit. The Pacific Crest Trail (PCT) is a 2,660 mile National Scenic Trail from the U.S. border with Mexico to the U.S. border with Canada. While most visitors to the trail are weekend or section hikers, several hundred through-hikers will complete the entire trail in one trip each year, typically a five month endeavor. The Bridge of the Gods serves as the link for PCT hikers to cross between Oregon and Washington on their journey. From the southern terminus, the bridge is located at mile #2,155. It is the lowest elevation point on the entire trail. The Community of Cascade Locks is also the only incorporated city directly on the PCT. Many hikers reach Cascade Locks in August. Each summer the friendly community welcomes PCT hikers to collect their resupply boxes, shower, camp, shop, do laundry, and enjoy hot restaurant food and cold beverages before hitting the trail again. The Annual PCT Days Festival in Cascade Locks is a celebration of this trail’s legacy. For more information, visit the PCTA website. For a regional map of day hikes and trail amenities along on the Pacific Crest Trail in the Columbia River Gorge National Scenic Area near the Bridge of the Gods, click here. Scientists believe that about 1,000 years ago, a giant landslide from the north shore of the Columbia River blocked the Gorge and stopped the river’s flow. This natural dam created an inland sea in eastern Oregon, Washington, and into Idaho. Over time, water eroded the dam and created an awesome natural stone bridge. Eventually, this bridge fell, creating the Cascade rapids. Native American legend also speaks of the creation and destruction of this natural bridge. The People of the Columbia River had great difficulty crossing the Columbia River. Manito, the Great Spirit, was sympathetic and build a stone bridge for them. This stone bridge, called the great crossover, was so important that Manito placed Loo-Wit, an old and wise woman, as its guardian. Over time, the People began to fear that the bridge would wash away, and they appealed to the Great Spirit. Manito agreed to protect the bridge, and the grateful People gave it a new name, the Bridge of the Gods. At about the same time, Manito also sent to earth his sons- three great snow mountains; Multnomah, the warrior (Mt. Rainier), Klickitat, the totem-maker (Mt. Adams), and Wyeast, the singer (Mt. Hood). All was peaceful until beautiful Squaw Mountain moved into a small valley between Klickitat and Wyeast. Squaw Mountain grew to love Wyeast, but thought it great fun to flirt with Klickitat, his big, good-natured brother. Soon a rivalry sprang up between the two brothers over Squaw Mountain. They argued, growled, stomped their feet, spat ashes and belched great clouds of black smoke. Each hurled white-hot rocks, setting fire to the forests and driving the people into hiding. Finally, they threw so many stones onto the Bridge of the Gods and shook the earth so hard that the stone bridge broke in the middle and fell in the river. Upon hearing this, Manito was angry and in punishment for the destruction of the bridge he caused a series of huge rapids to form in the river. Meanwhile, Klickitat won the fight over Squaw Mountain and Wyeast admitted defeat. This was a severe blow to Squaw Mountain as she loved Wyeast. Though she took her place by Klickitat, her heart was broken, and she sank into a permanent deep sleep. She is known today as Sleeping Beauty and lies where she fell, just west of Mt. Adams. When this happened, Klickitat had a high, straight head, like Wyeast. But Klickitat truly loved Squaw Mountain, and her fate caused him such grief that he dropped his head in shame and has never raised it again. During the war Loo-Wit, the guardian of the bridge, tried to stop the fight but she failed and fell with it. The Great Spirit heard of her faithfulness and promised to grant her a wish. She asked to be made young and beautiful once more. However, being old in spirit she did not desire companionship. The Great Spirit granted Loo-Wit her wish. He turned her into the most beautiful of all the mountains and allowed her to settle by herself far to the west. She is now known as the youngest mountain in the Cascades, the beautiful and powerful Mt. St. Helens. The Bridge of the Gods as it exists today was created in a much less dramatic fashion than the original bridge, but it sits in beautiful contrast to the powerful scenery of the Gorge. The cantilevered bridge is the third oldest bridge on the Columbia River. In 1920, the US War Department issued a construction permit for the bridge to the Interstate Construction Corporation. By 1925, the company had managed only to construct one pier. Wauna Toll Bridge Company purchased Interstate’s interest in the bridge in October 1926 at a cost of $602,077. The finished structure has a cantilever main span of 707’9″, with 211’8″ anchor arms. The total cantilever structure length is 1,131 feet and overall bridge length is 1,858 feet, with a width of 35 feet. The original bridge had a wooden deck and was 91 feet above the river. The 1938 completion of Bonneville Dam necessitated raising the bridge 44 feet to accommodate the rise in backwater. Congress allotted funding for the project which was completed in 1940 for $762,276. In 1953, the Columbia River Bridge Company acquired the bridge and after 8 years of discussion, the Port of Cascade Locks Commission purchased the bridge with $950,000 in revenue bonds, issued on November 1, 1961. Today, the bridge is owned and operated by the Port of Cascade Locks. In 1966, the Commission authorized a second $300,000 revenue bond for re-decking, painting and construction of a new toll canopy. Revenues from the bridge pay for maintenance, painting, inspections, and bond repayment. While the original cost to build the bridge was $602,077, today it would cost around $270 million to replace the bridge. The 15-Year Maintenance Preservation Plan was adopted by the Port of Cascade Locks Commission on January 17, 2019.